I’m a conflicted cycling pontificator when it comes to “La Primavera.” The first of the monuments is friggin’ gorgeous and reeks of sultry history. 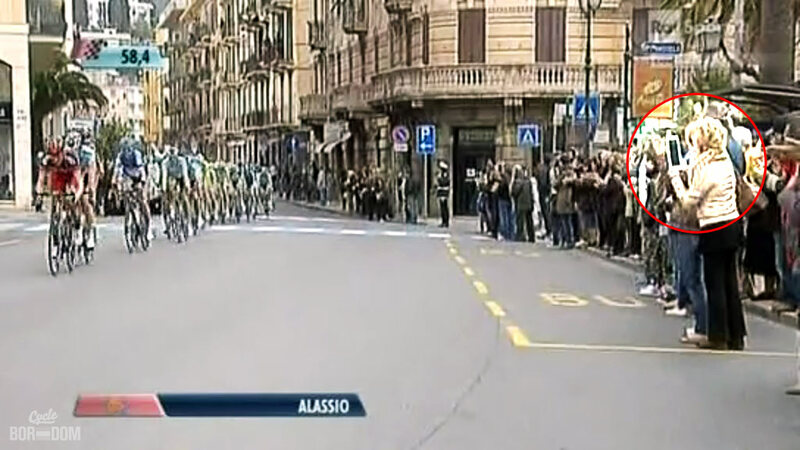 But, (and it’s a big one), I simply can’t get it up for Milan-San Remo. 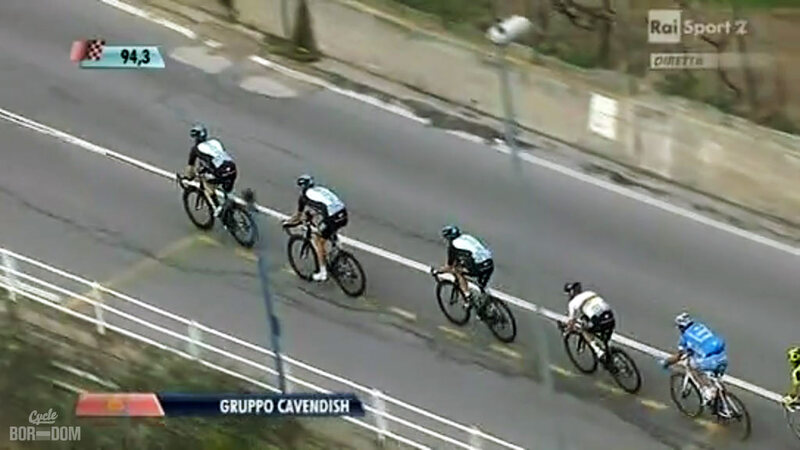 Yet, oddly enough, I was ecstatic during the finale of the 2012 edition once Cavendish had been blown out the backside of the peloton. I say oddly, as RCS now sees fit to change the finish of the oft ****ed-with race. 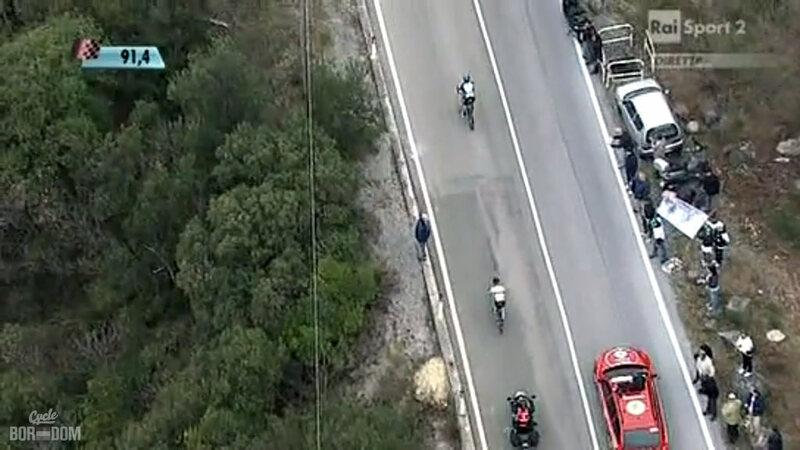 It ain’t the ending boys, it’s the nonsensical first 3/4 of the race ridden in traditional Italian “piaaaaaanoooooo” style. 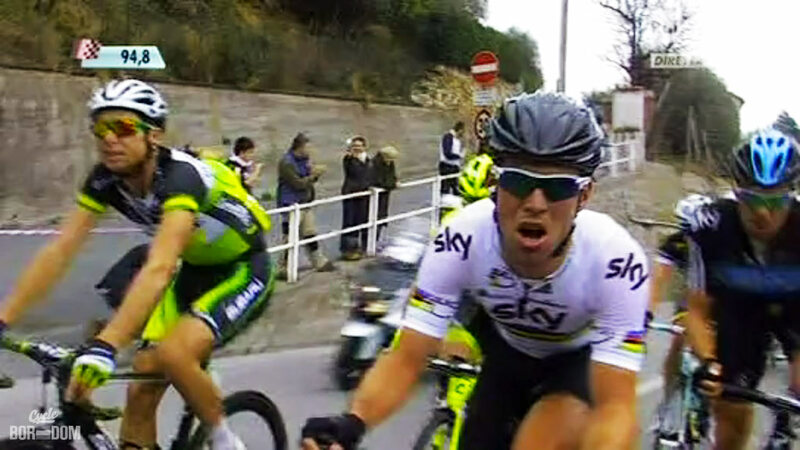 But, this is a recap of the race—time for screencap pr0n. Ohhhh boy, did the World Champ have a bad day. Let us indulge, shall we? There’s no hiding when you’re wearing the rainbow bands. 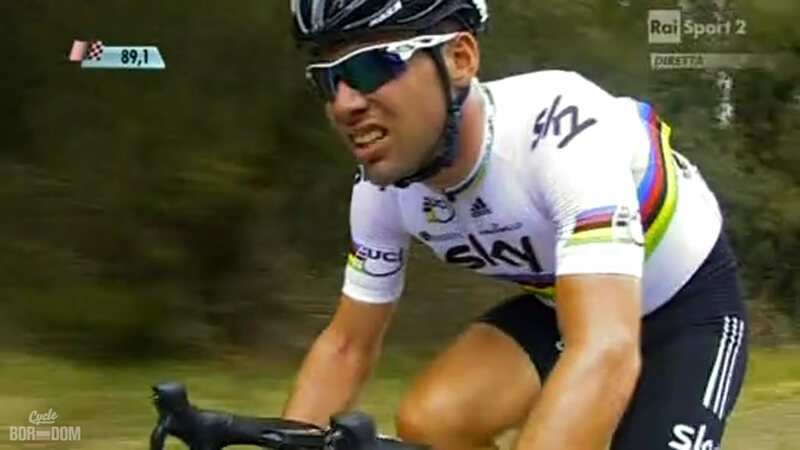 The painful constipation of being blown out the back. That’s more than enough. I have plenty in reserve, but there was actually a Classics monument taking place. Being this is MSR, this will be the longest section of the post. EVERYTHING happens before the strategic portion of the race. This has to be the worst screen graphic, evah. Hey ladies, it’s *this* hand. This guy is a PRO?! Are those spacers? What’s wrong with his armwarmers? WTF?! 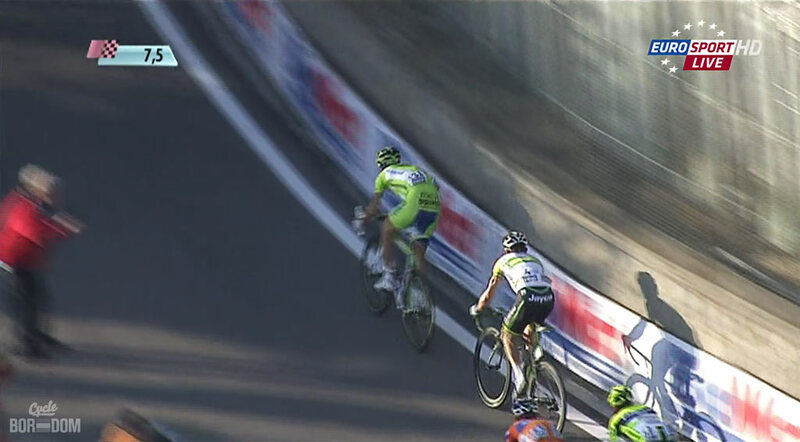 Guarantee this is the ONLY time you’ll ever see Cipo between another man’s legs. 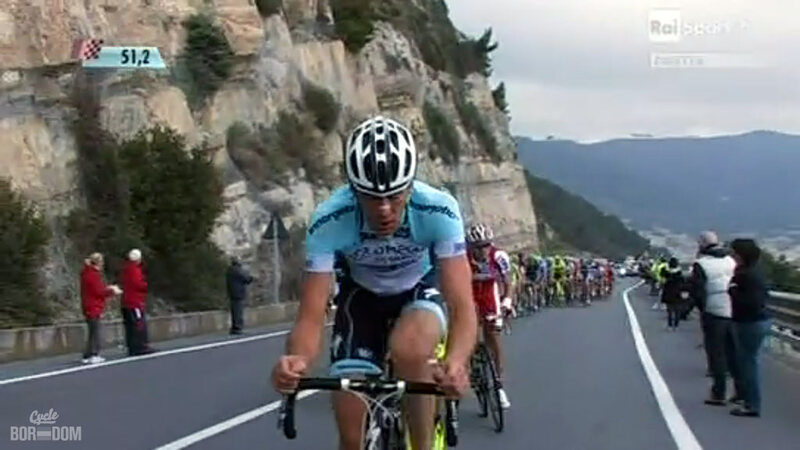 Gilbert WTF-ing like a boss. Now it’s time to start racing like a boss. 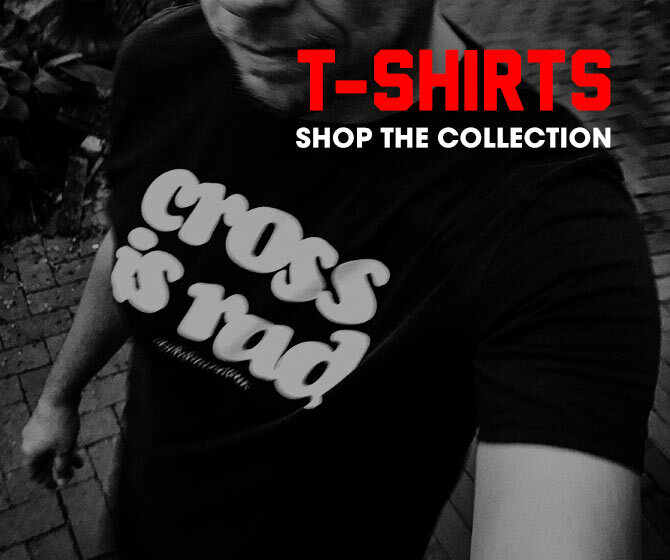 Stijn’s either mugging for the camera, or looking for a date, or both. Editors note: I had to cut this **** short. 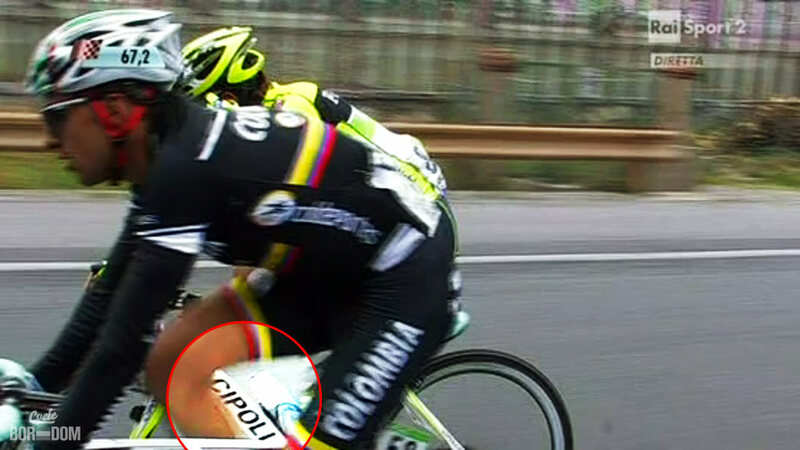 There’s a crapload more of OPQS height doping and other random pelotonal hi jinx, but this is just way too effing long. We were treated to the annual fireworks festa on the Poggio, but what was different this time was the move stuck. 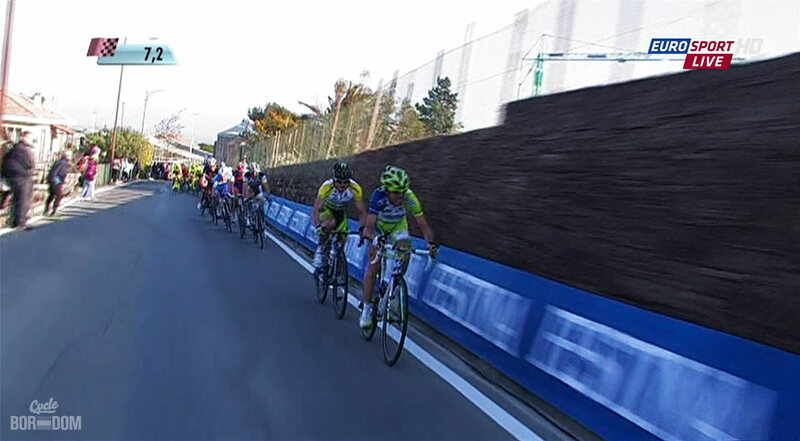 Vincenzo Nibali took the initiative by making the attacking, immediately followed by Simon Gerrans. 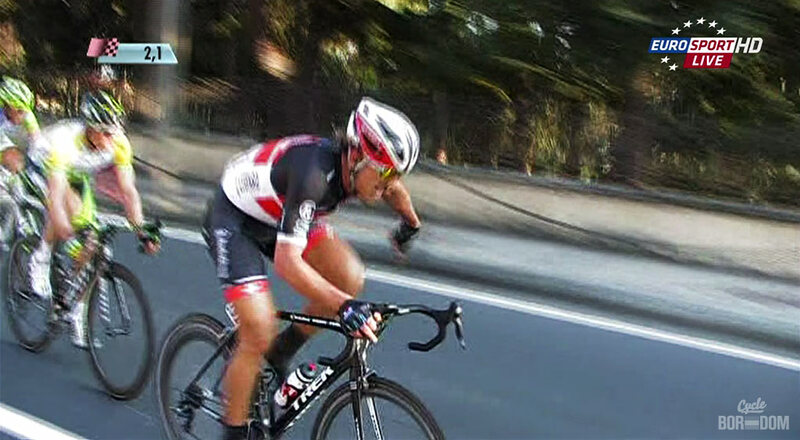 Ominously, and when is any move by Fabs not ominous, Fabian Cancellara also marked the move from a little further back. 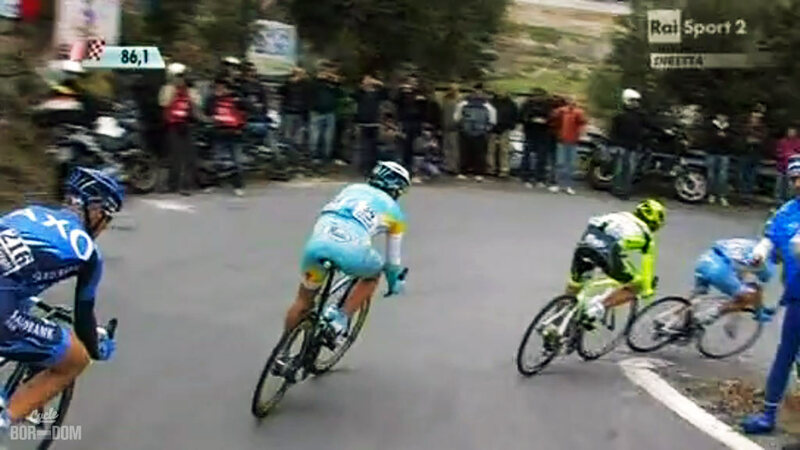 Once the Swiss rider caught the two escapees, the move instantly transformed into a #FabsClinic. 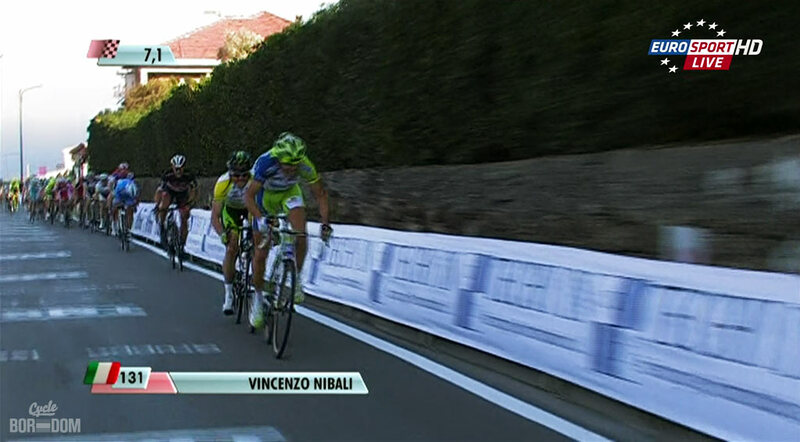 Nibz just about to break free of the peloton’s gravitational pull—Gerrans right on his six. 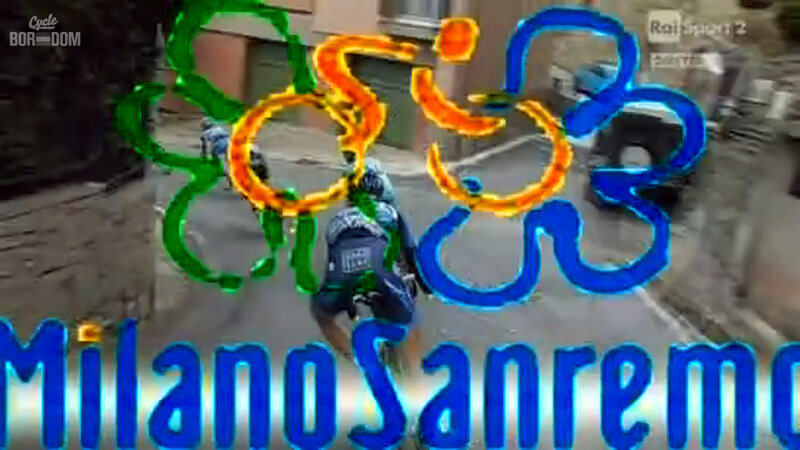 Nibali as Lando and Gerrans as that dude with the flappy cheeks shooting out of the Death Star. Threading the needle between two damaged Tie Fighters, the pair continue their escape. Nibz and Gerro trying to make the Kessel Run in 12 parsecs. 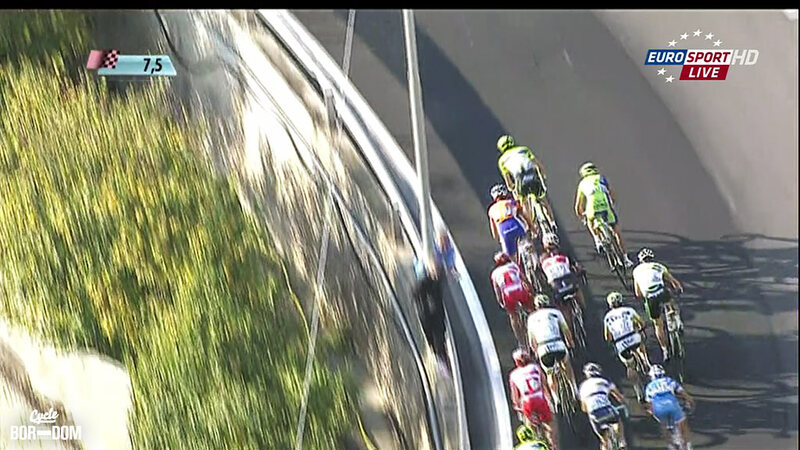 Fabs hidden in the trailing group. The dark lord of the Sith is swift—he ruthlessly closes the gap. Annnnnd just like that, the #FabsClinic begins. 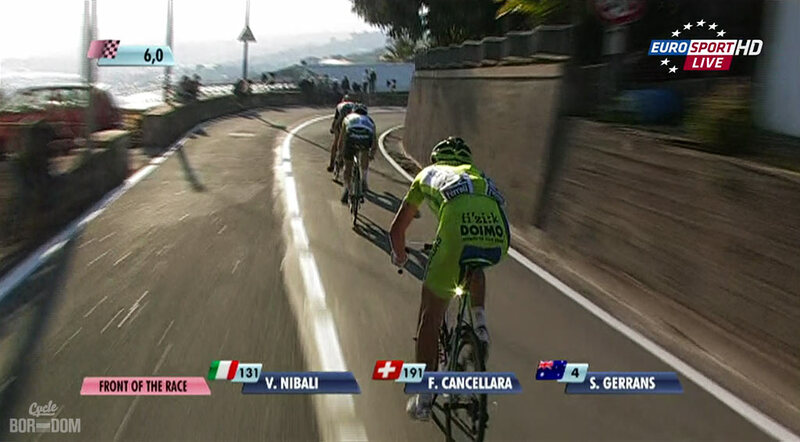 Nibali struggles to keep the gaps from forming, but can’t match the descending of Fabs and Gerro. 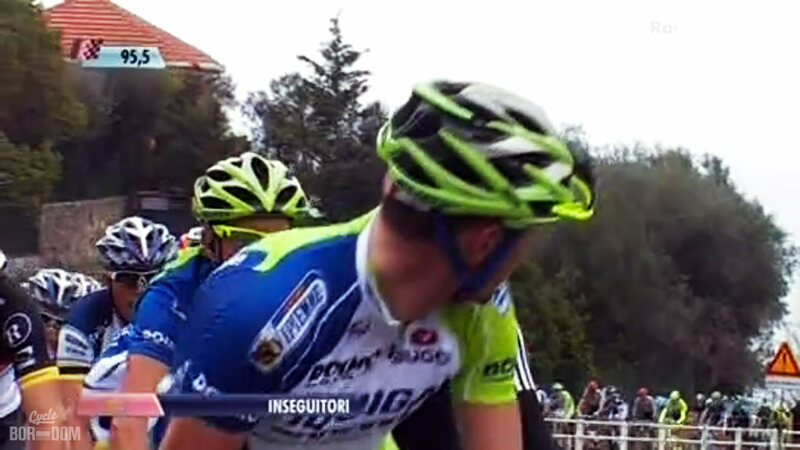 This is the exact point where RCS wants to end #MSR. Nibz iz still not #WEENING. LOLZ. 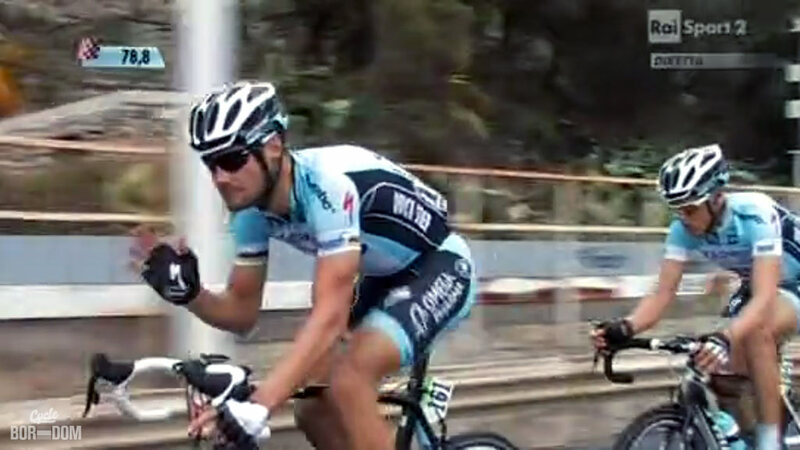 Fabs performs the international symbol for “form my leadout train, bitchez”, but to no avail. 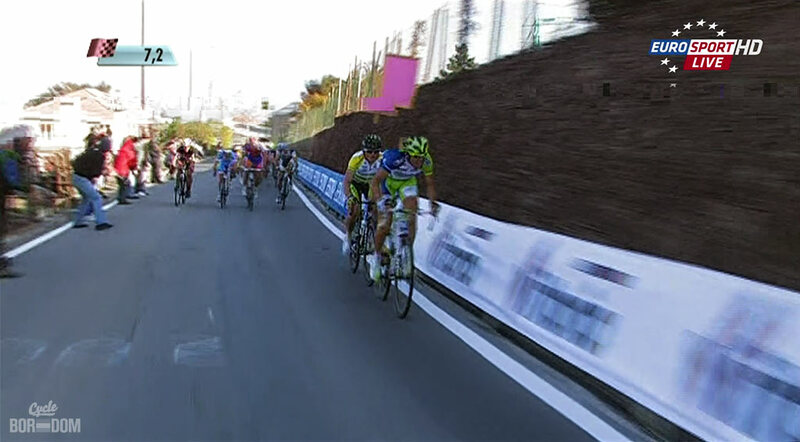 Ooopsie, Gerro comes ’round the “strongest rider” and takes the win. Soooo, there was a little bit of a discussion over Gerro’s win. 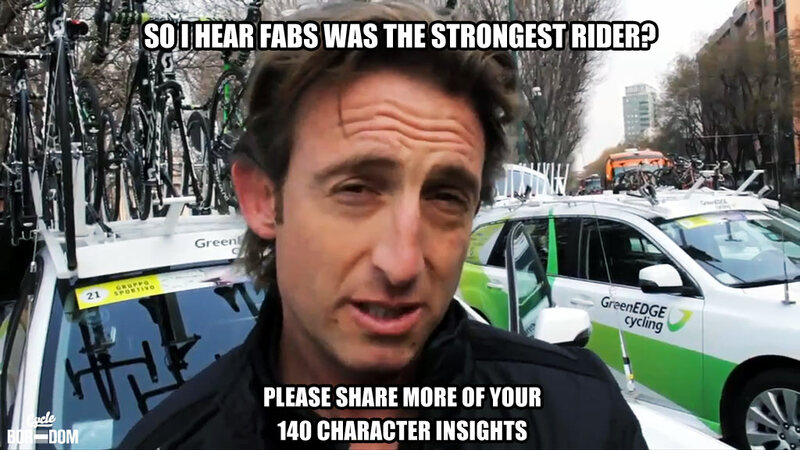 Matty White tells it straight.